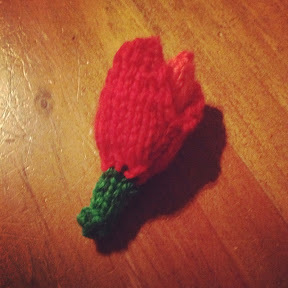 Another flower- I swear I will knit a whole weed-free garden! K2 tog, cut yarn, thread and pull to tighten. 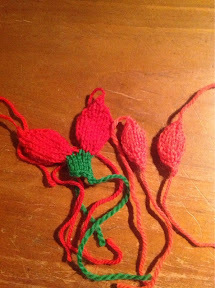 With both petals on the needle, push together and knit the 6 stitches as one row. Sew inner petals together at the bottom (the cast off bit) leaving the tops open like petals. Place inside outer petals with stem. Stitch in. Sew up outer petals to half way up e petal securing the inner petals inside. Stitch up the side of the stem. Sew on a pin back.